If you've never lost yourself in the world of Shin Megami Tensei: Persona, you're missing out on one of the most unique RPG franchises available. 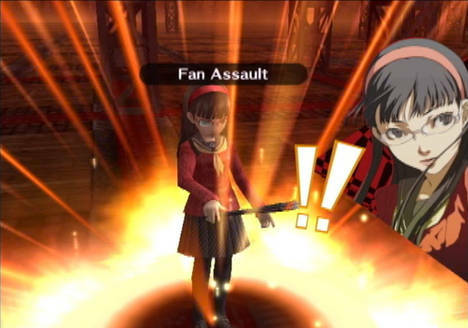 The series' games take place in modern-day (or near-future) Japan, and instead of being medieval knights and wizards, you play as high school teens with the ability to summon "Personas" to aid them in the battle against evil. Last year's somewhat controversial Persona 3 and Persona 3: FES were role-playing hits on the aging PlayStation 2 hardware, both being praised for throwing convention out the window, often called something like "the game where the kids shoot themselves in the head." Atlus is back with their one-of-a-kind RPG formula, now applied to a new story and setting in Persona 4. While its predecessor was widely received as a success, fans were vocal about their concerns and suggestions with this game. Atlus had an opportunity to take these concerns and suggestions and create a fresh new title. The good news is that it definitely seems like Atlus paid attention. The result is an RPG even more unique and enjoyable than Persona 3. Persona 4 moves away from the bustling portside city setting of its predecessor and into the country. The next chapter is set in a rural Japanese town called Inaba, where everyone knows everyone else, and nothing really exciting happens... yet. You become the nameless protagonist, the new kid in town. You're staying with your police detective uncle and his daughter for the year, taking a break from the big city. Just as you begin to get settled in your new surroundings, the sleepy town makes national headlines when a celebrity is found murdered there. Your life takes a turn for the weird when you find yourself sucked into a television screen, entering another dimension completely. One of the real strengths of Persona 4 is its story and pacing. That's not to say that Persona 3's story was bad, but it did have sections that lulled, and sometimes motivations and goals were unclear. There's never a dull moment in Inaba, though, as you and your friends work to help uncover the secrets behind the recent murder and your newly awakened powers. From the beginning, you'll find yourself on your toes, meeting new people, going to new places, and uncovering new powers. Sometimes it seems like there is so much going on that you feel like you'll lose track of everything. As the in-game days pass, you'll find yourself totally immersed, feeling like a real resident of this little Japanese town. Persona 4 does follow Persona 3's day-to-day formula, with the passing of time being a constant. As the protagonist, you'll still get up in the morning, go to school, do some after-school activity, and then go home to do it all again tomorrow, all while fighting evil in your downtime. This game has received some major upgrades when it comes to what you do in that downtime, though. You can now apply for jobs, buy books at a bookstore, go fishing, take up cooking, and so much more. All of these actions play into Persona 4's stat building system. Reading a book, for example, will increase your Knowledge, which will better help you relate to others. Getting a part time job folding envelopes will increase your Diligence. And stealing your uncle's dinner out of the fridge before he comes home may increase your Courage, and we all know that it takes plenty of courage to talk to the girls at school. Another aspect that makes Persona 4 so immersive is the player's ability to choose the protagonist's direction by answering questions. Just about everything is posed to you as a multiple-choice question, and your answers carry real weight as they determine the strength of your relationships, the success of your love life, and even your in-battle power. Between the duties, commitments, and relationships you establish, Persona 4 manages to weave a web so complex that you'll feel like the whole world revolves around you. All of your actions affect your Social Links. You'll court girls, console friends, and help people in need, all the while making yourself (and your Persona) stronger. What really does the trick as far as immersion goes is the outstanding script, dialogue, and voice acting. Between all of these life-sim obligations, you're interacting with characters that are written and performed so well that you'll feel like you know them before long. And while we don't want to reveal too much about the story, the way it's designed really puts a focus on each character's personal issues. The result is something so intimate and comfortable that you find yourself becoming attached. While the last series title let players mostly pace themselves, Persona 4 gives you strict deadlines. Time management is often your biggest responsibility. You'll juggle jobs, hobbies, and friendships -- all while saving the world. 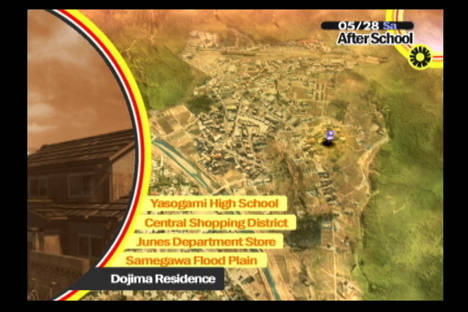 This time around, instead of following phases of the moon, events in Inaba are triggered by changes in weather. Sunny days are peaceful, while rainy days are a sign of something bad on the horizon. And foggy days? You don't want it to be foggy for long in Inaba. It might reveal too much about the story to explain why, but know that you'll be working to save the day before it gets too foggy. 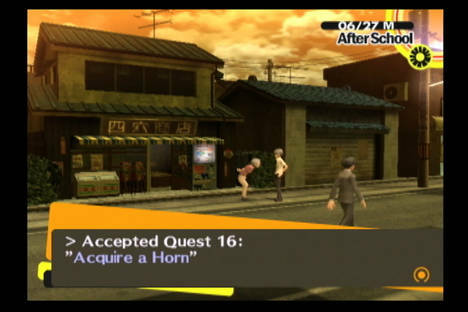 There's always something to do in Persona 4, and you'll always find yourself wanting to do it. 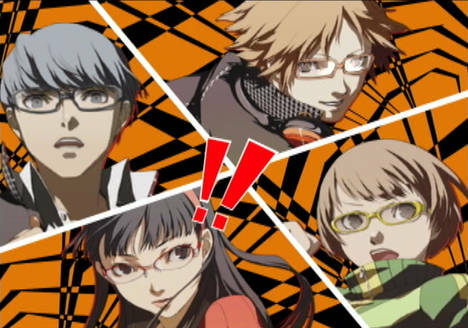 At its core, Persona 4 is still a turn-based RPG where you'll move through dungeons, fighting monsters. But you can forget moving up one endless tower, like in Persona 3. Now you'll move to smaller separate dungeons, which manage to divide the game up into stages. Each one is fresh and different, sporting its own look and music. You won't believe some of the sounds and sights you'll encounter in each dungeon. To describe any of them would spoil the story, but I can say that Persona 3's randomly-generated, dark, demonic dungeons look silly by comparison. Also of note is the ability to use an item to leave a dungeon, and then come back to start on the floor you left. Those that played Persona 3 will definitely appreciate this addition of this feature. The battle system has also received some notable upgrades from its predecessor. The biggest one is that you can control all four of your party members in battle individually. One of the biggest complaints in Persona 3 is that your auto-controlled support characters would make bad choices, and players could only provide general guidance and not complete control. Now you'll be able to command your teammates to your heart's content, though automatic modes are still available. You can now also guard against attacks, canceling out your elemental weaknesses. And when your Social Links are leveled up, you'll find that the other characters acquire special abilities in battle, like assists and and blocks. These may sound like small improvements, but the combination makes battles in Persona 4 far more enjoyable and quite a bit less stressful than they were in Persona 3. 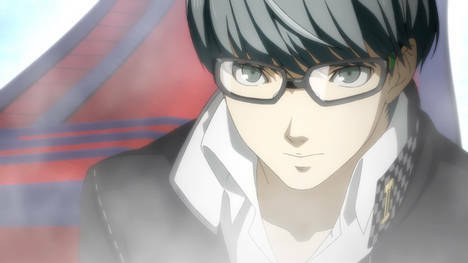 Now gamers can solely focus on their strategy and tactics, which alone makes Persona 4 a better game than 3. One of the easiest things to appreciate about Persona 4 is its presentation. There's a very cool visual style that runs throughout the game that manages to be both retro and futuristic, with bold colors and themes that show in everything from the in-game menus to the background art. Even the protagonist seems very hip, and in-game characters seem to have an appreciation for that. As always, the character art is fantastic, and the game is studded with gorgeous animated sequences to move the story along. This is the PS2 going out in style, folks. The star here is the fantastic soundtrack by Shoji Meguro, probably his best Persona-series soundtrack yet. Gone (mostly) are the silly hip-hop tunes and mumbly-mouthed raps. They've been replaced by slick J-pop-ish melodies and catchy beat-based grooves. The battle song is still great, and I've heard it hundreds of times now. Add in some fun jingles and a killer introduction/theme song, and you'll be humming and dancing along the whole time. Anyone that is familiar with Japanese culture will surely appreciate how smart Persona 4's story is. It's packed with social commentary on Japan and its people. Issues like big business corporations flushing out privately owned ones is focused on heavily. There's also a pop idol character that's tired of the grind. 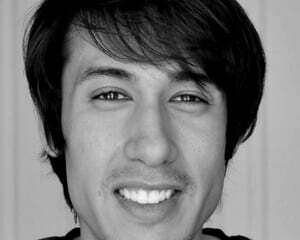 Another questions his sexuality, and homosexual feelings are explored. Many of the characters have to deal with repressed feelings. Overall, it's a very smart story, packing much more depth and meaning than Persona 3. The protagonist being sucked into a television is a pretty good representation of what happens to gamers when they play Persona 4. This beautifully crafted story manages to draw you in from the get-go, and the exceptional script, acting, and pacing do the rest. Before you know it, you're playing a game you can't put down, fully immersed in a story you can't get out of your head. It's definitely long, but never boring, and a hell of a lot of game for $40. Series fans, this is your dream game. Atlus managed to combine the best of what already worked well with fresh new ideas and tweaks, and the end result is a fantastic role-playing game -- definitely a shoo-in for RPG of the year. Unless you dislike the genre, do not, under any circumstances, miss Persona 4.